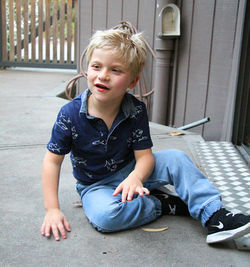 Max is a loving 5-year-old who likes water, lights, bright colours and music. He was born with Pitt-Hopkins Syndrome. Unable to use the slides in the park, TAD volunteer Jim, constructed a play set which met all of Max&apos;s needs. We would like you to meet Max. Max is a loving 5-year-old who likes water, lights, bright colours and music. He was born with Pitt-Hopkins Syndrome which means that he has severe physical and cognitive developmental delay. Max can crawl and is just learning to walk with a frame. He is non-verbal with very limited communication and is 100% dependent in all aspects of his life. His Favorited part of his day is going to the park and going down the slides. A younger Max was easily lifted onto the slides but now he is too big and much heavier making it hard to get him onto the slide as he cannot climb up by himself. The family looked into buying a slide for Max to enjoy at home but all commercial slides they found had ladders to climb up, something Max cannot do. Max needed steps and rails to get up to the top of the slide. It had to be sturdy and safe and built to the right angle. Jim Barrett, TAD Volunteer, took on the project and constructed an amazing playset which met all of Max’s needs.It has been amazing for Max and combines play and physio sessions for strength, coordination, challenge and reward. “It is even helping his communication as he signs ‘more, more, more’ after every slide,” says mum Rachel. The playset was made with a growing boy in mind. 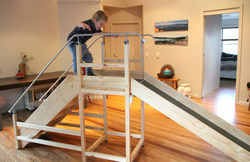 The rails are adjustable and can be raised higher as Max grows helping him stand up straight as he tackles the stairs. He loves his new playset so much that if allowed he would use it all day every day. 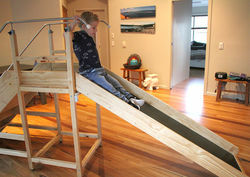 “This playset is now making Max’s physio and playtime fun… he loves it!” says Rachel.